The .iso is 188 MB. Important note about themes, Due to changes in the edje file format older themes need to be updated for use with this build of e17. 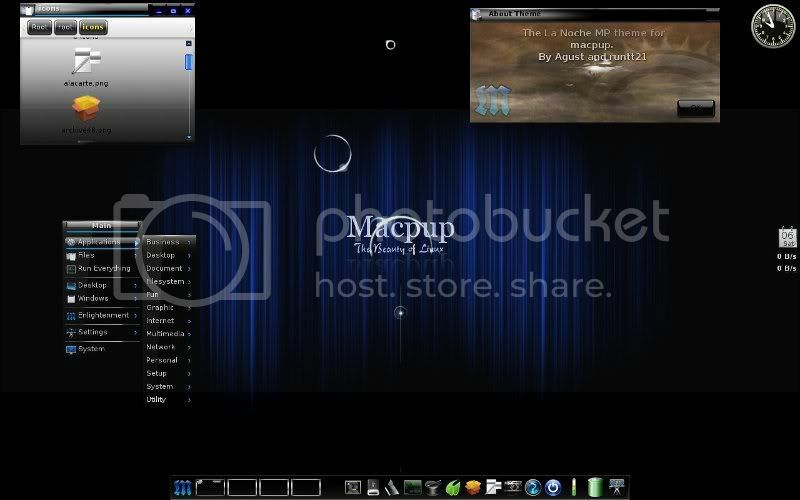 For themes less than 6 months old you can run edje_convert on and they should work but the setting panel may be messed up.Themes older than that have components edje no longer supports and will crash this build of E.
This version of Macpup will boot to desktop in almost all cases and from that screen you can make adjustments if they are needed or wanted. If it does not boot to a graphical screen, it might boot to a “prompt.” If that happens please enter ‘xorgwizard’ and then enter it again ‘xorgwizard’, which will allow you to configure Macpup. If it does not boot to a prompt but a black screen, then you should reboot the CD and press f1 and enter ‘puppy pfix=nox’, in the space that asks for any boot options. Then at the prompt enter ‘xorgwizard’ twice. As soon as the desktop comes up you will be online please click on the top hat on the ibar and run the firewall wizard.This pup comes with a cut down version of the Midori browser. 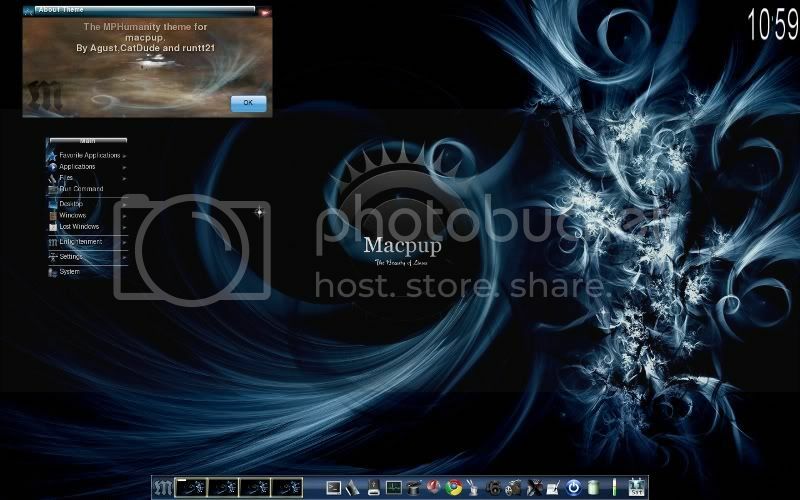 It is strongly suggested that you install a additional browser.Extra browsers are available from the puppy package manager ( menu-applications-setup)or from quickpet on the ibar. You will need to make an adjustment to maximize apps full size,like browsers.First go to menu-settings-shelves . 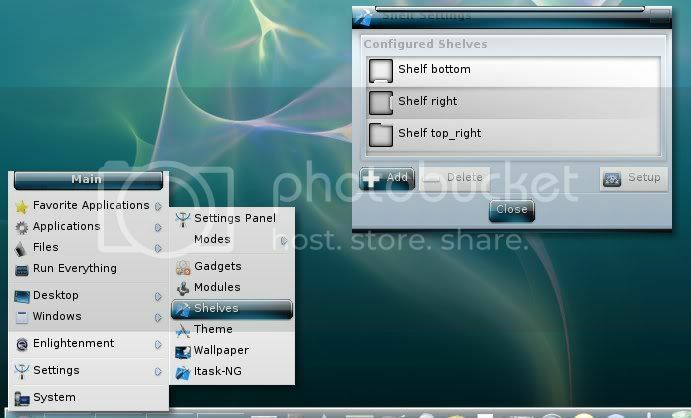 The configure shelves window will open .You will need to make this change on both right side shelves. First select a shelf then click setup. When the shelf setting window opens click on " Allow windows to overlap the shelf" then click apply. Repeat for the other right side shelf. Do not load the composite module it doesn't work correctly. The extra modules CPU and Places don't work. Extra themes!!!! 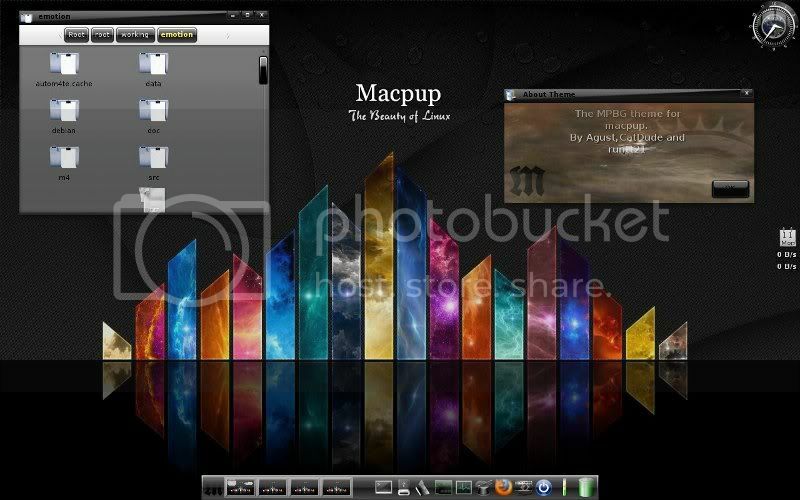 I have posted several .pets of updated themes on my Macpup page. 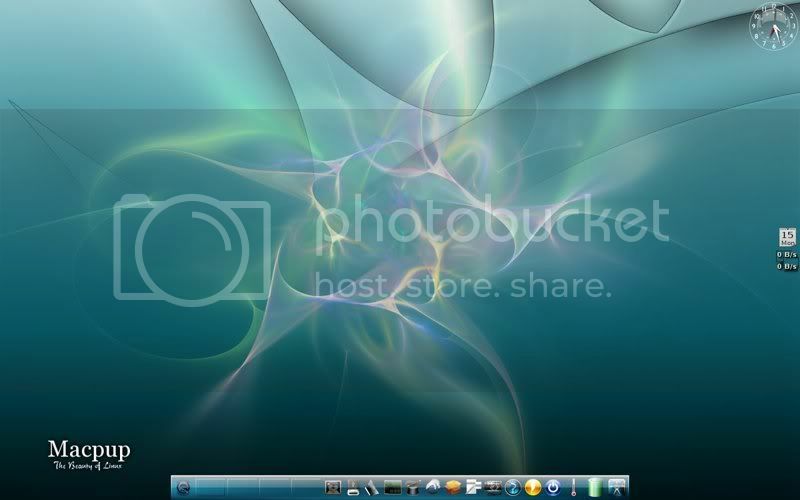 Please use the one that are MP511-themes.pets . 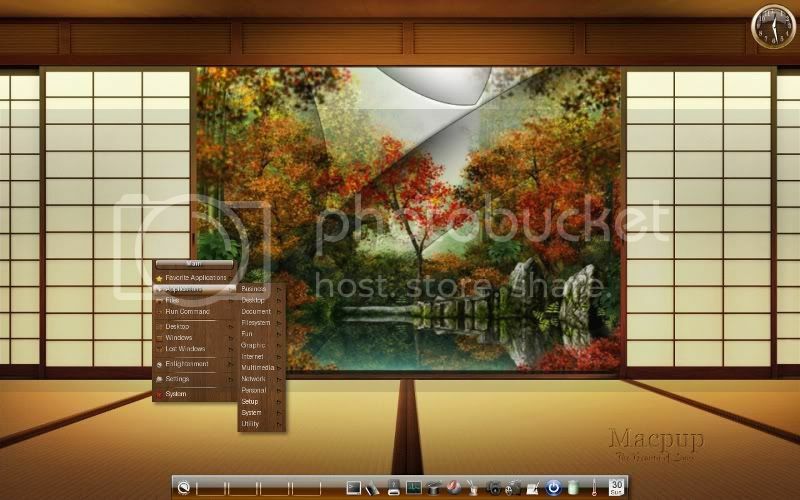 All of the other theme.pets or .edj files dont run in this version. 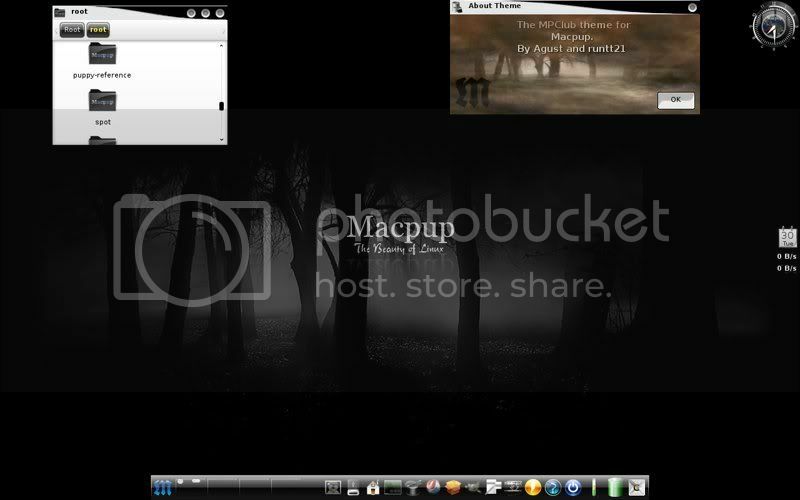 Sneekylinux's video doesn't quite do Macpup 511 justice, in my opinion. It just looks fantastic, everything is very polished, this is nicer than Elive. Already given it a good live run.........looks great.Congrats. 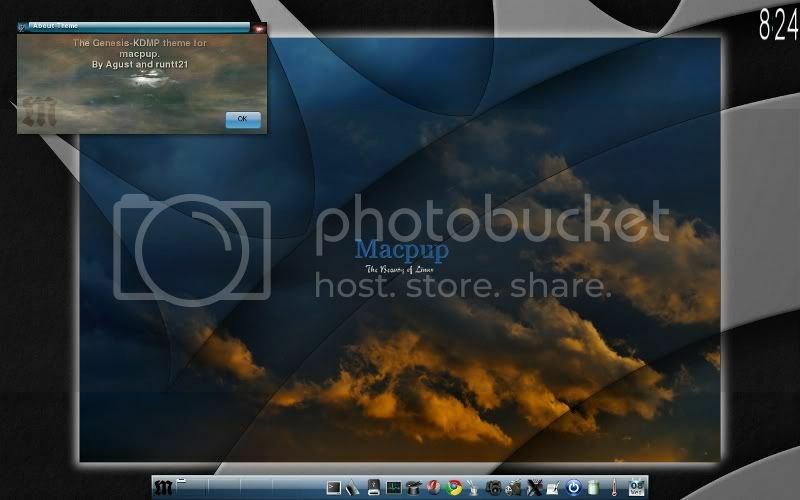 I'm loving the new macpup but I've come across a few issues. Namely when trying to apply the composite module e crashes so bad I have to delete the /root/.e/e/config folder to get it working again. And also itaskNG has strange artifacts underneath the icons where the shadows should be. Anyone know the cause? EDIT: I also have had issues with e crashing randomly and I havent found the source yet. In the end it says gadman was unloaded. In other e versions hitting f1 would usually fix e but this hasnt work thus far in this version. hitting f1 only resets e and then it crashes again. ad to illustrate the artifacts under the itaskNG i included a screenshot. Also quick pet fails when trying to install seamonkey. But was fine through pet get. 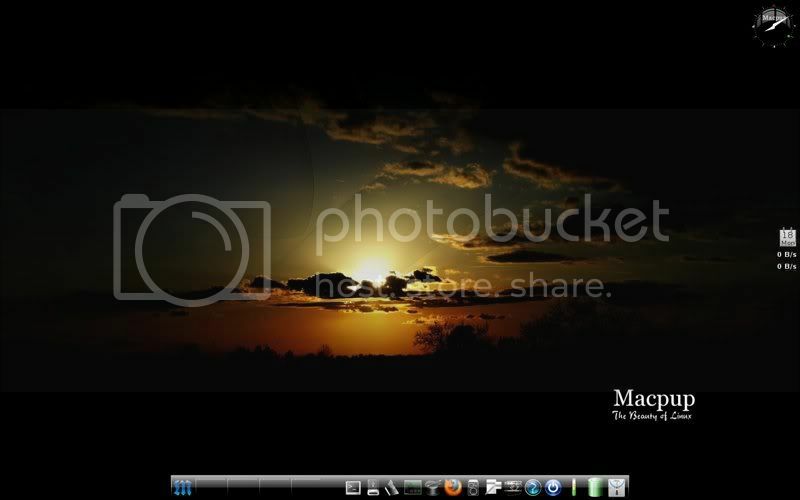 For Sound : Applications > Setup > ALSA or left or right click the retrovol icon in the tray of the taskbar at jwm . Hadn't been at the other wms until now ... E-16.999.52995 is running fantastic on frugal install ! @Joel I dont use composite on my computers so I cant help you with that . I taskng puts a reflection under each icon ,its set up to be on the bottom. I think you have a bad download ,no one had those kind of issues during testing . This has been one of the most stable builds of e for me. I would suggest using arora I have been using it for a while and it is the fastest browser I have tried yet. @dealora The menu icon is the first thing on the left side of the bottom shelf. This thing has just exploded on twitter. Google had 14 pages under the "last 24 hrs" Almost all of it is just repeating the announcement but WOW. Dont even ask about the download count .Prit is going to recheck the scripts when he gets home. @sneekylinux: I didn't mean your video wasn't good, just that you can't really get the feel for how nice it is just watching a video. The desktop experience is much richer in real life! is no problem mate,but you are right,you really do have to use it to get the feel and speed and just the down right beauty of it. Perhaps It was a bad download because this is the most buggy e17 in a while. 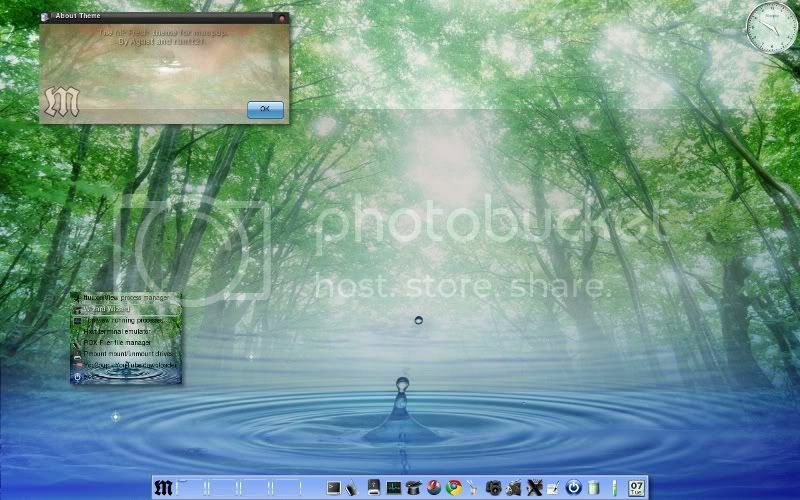 And btw the compositing I was talking about was the e module called compositr not anything like compiz of xcompmgr. That and many other modules cause a seg crash of e. I've tried installs on 2 machines and same thing I'll try another download but frankly if the iso burned, installed, and ran I figure the d/l couldn't be bad. A shame to because it was so slick. Anyone else having e crash when usin different modules? And also the white bars under the itaskng are not shadows thy are white boxes that shouldn't be there. And again it occursnon both installs I've done.